← FREE Street Theatre Workshops! The Hours– The perfect spot to sit and unwind, to catch up with family and friends in relaxed surroundings with the daily papers, close at hand… in fact it’s the just the place to wile away the hours. 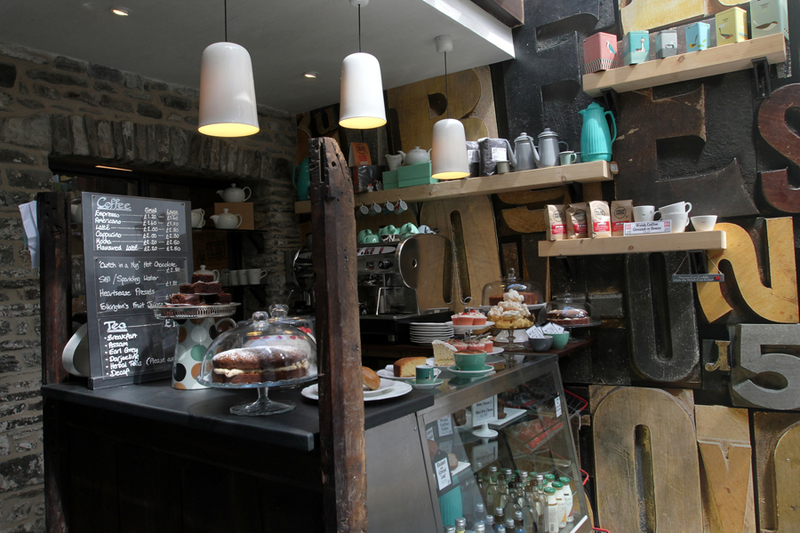 The Old Printing Office, Llandovery – hidden behind a gift shop full of treasures, pull up a chair and enjoy the homemade cakes after some hard browsing. The Bakers Table–make everything from scratch including bread, cakes, lunches, pastries and savouries, with even a wood fired oven for pizzas! Beacons Farm Shop and Welsh Venison Centre, Bwlch-Sit down in our small unique café and watch the deer, sheep and cattle roam around in the field. We are always coming up with new items for our menu and it changes upon the seasons and availability. We use as much locally sourced products as possible. Pop in and enjoy a coffee and cake or share a giant tea cake with a pot of Welsh Brew tea. The Walnut Tree Store and Cafe, Llangynidr- enjoy freshly made cake and sandwiches, with fish and chips nights most Fridays. They also have a new wine bar! The Waterfront at Theatr Brycheiniog-The Waterfront, with its wonderful canal views and peaceful location, is open throughout the day, selling a wide variety of food, from breakfast to light bites, along with mouth watering coffee and cakes. Delicious Llanfaes Dairy ice cream is also available in a variety of flavours from our summer time soft scoop counter. National Park Visitor Centre & Tea Rooms, Libanus – find out everything you need to know about the Brecon Beacons then stock up on treats from the cafe for your exploring. The River Cafe at Glasbury-for its beautiful setting on the river. The River Cafe is licensed and a great place for couples and groups to meet in an informal setting. Get together to enjoy fresh food cooked daily, a pint of local ale, and some excellent homemade cakes. This entry was posted in Food, food and drink, Local Produce, places to eat, Things to do and tagged brecon beacons, cafes, coffee, Drink, food, new, summer, tearooms. Bookmark the permalink.